Found on bushy slopes, rocky mountainsides and terraced fields where there are dense conifer forests and sparse undergrowth. Males are brightly colored with a red chest, a golden-yellow crest and a long tail. Such festive coloring contributes to the courtship displays. Females are brown, beige and black. 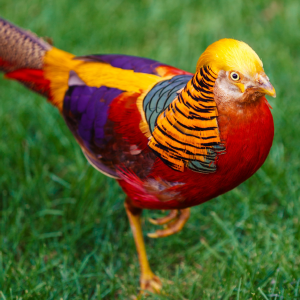 In China people think of Golden Pheasant as a sign of good luck, best fate and prosperity. Although they can fly in short bursts, they are quite clumsy in flight and spend most of their time on the ground.